Production designer Hannah Beachler was responsible for devising the look of Black Panther, from the waterfall amphitheaters of Wakanda to its high-tech laboratories and aircraft. Marvel's Black Panther is up for seven Academy Awards this Sunday. It could be the first superhero movie to win for best picture. Its costume designer Ruth Carter is an Oscar nominee. The film is nominated for best original score and best original song. One Oscar nomination has already made history: Hannah Beachler is the first African-American ever nominated for the award in production design. She helped create the cinematic world of Wakanda. The Black Panther is T'Challa, king of Wakanda, a fictional African country that was never colonized and is rich with tradition and advanced technology. 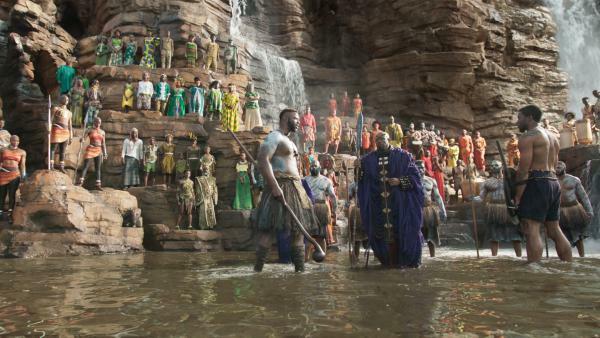 Director Ryan Coogler says he wanted Wakanda to look and feel authentic. 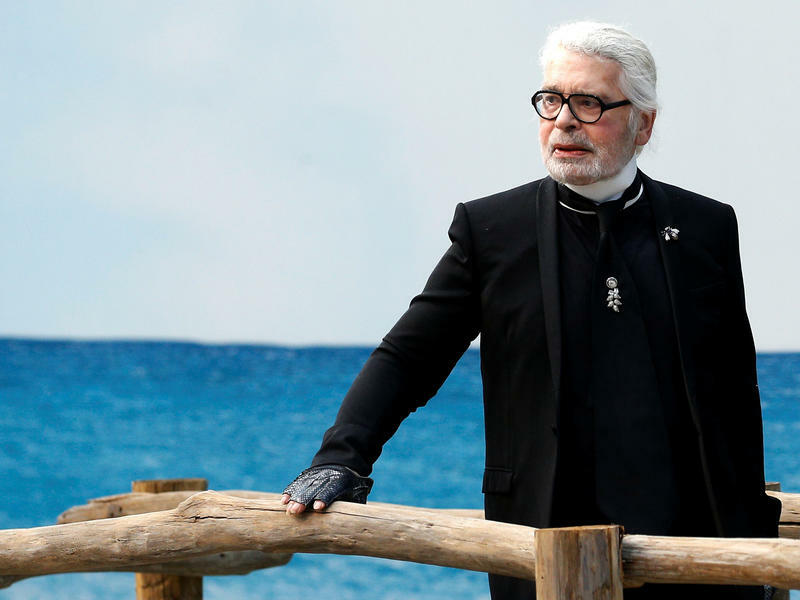 So he called on Beachler, his longtime production designer. They traveled around Africa researching cultures, scouting locations and collecting ideas. "The rocks, the moss on the rocks, how the rocks were formed, how they were layered, the color of them — everything around me that was nature I took pictures of," Beachler says. Beachler also took note of the architecture, clothing, food, transportation and ways of life. She incorporated many of those aesthetics with concepts from the original Marvel comics, created by Stan Lee and Jack Kirby. 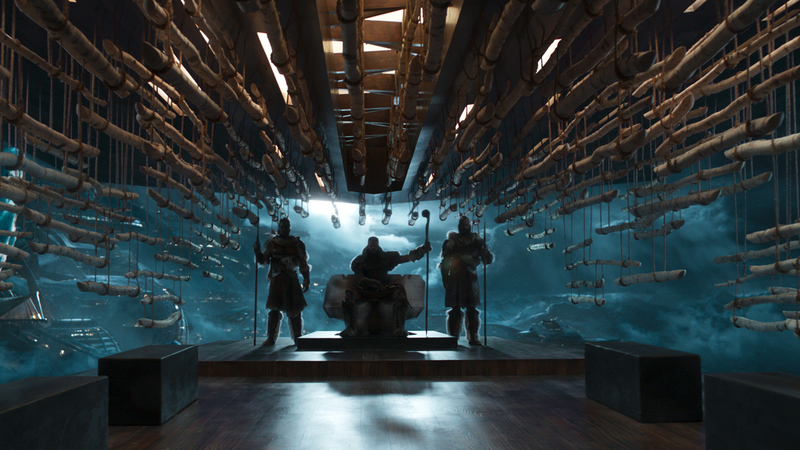 The throne room of M'Baku (Winston Duke), leader of the mountainous Jabari tribe, is another of Hannah Beachler's design concepts. Beachler came up with a visual history and guidebook for Wakanda — what she calls a bible for the movie. "To get to the design, I had to come up with stories about why this would particularly be there," she says. "Was it always there, and where did it come [from] — did it move? So that's where we started." The Black Panther bible — 515 pages long — included not just the designs, but the histories for Wakanda's buildings, its epic waterfalls, its technology. She designed a throne room with suspended birch logs, and a pristine, high-tech design laboratory. She imagined the backstory for mining vibranium, the potent and virtually indestructible element powering Wakanda. 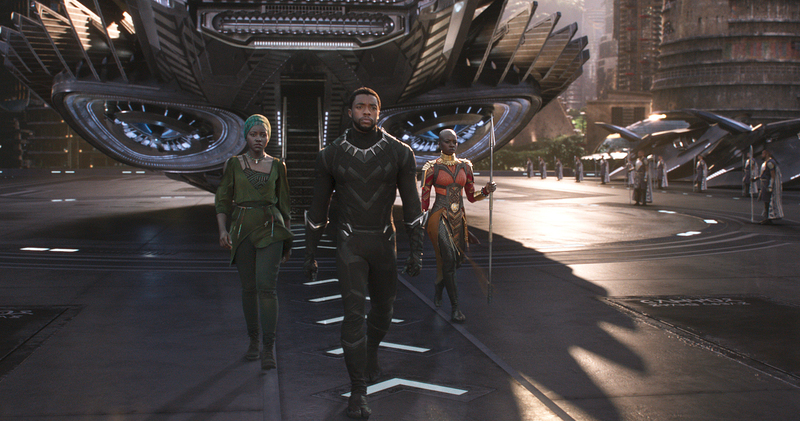 In the movie's DVD commentary, Coogler talks with Beachler about creating this vision: "We wanted Wakanda to feel old — we wanted to feel the history," he says. Beachler made other production design bibles for Coogler when she designed his 2013 movie Fruitvale Station, set in his hometown of Oakland, Calif., and for the boxing world of his 2015 movie Creed. This time, the director says, his friend's work included T'Challa's aircraft, called a Royal Talon Flyer. "Hannah kind of designed it to look like a mask from the top down," Coogler says. "One thing that I really like is on the bottom, we got these sonic things, and they kind of remind me of subwoofers." Nakia (Lupita Nyong'o), T'Challa (Chadwick Boseman) and Okoye (Danai Gurira) emerge from a Wakandan aircraft in Black Panther. Beachler's 20-year-old son Dominic marvels at his mother's working partnership with Coogler. "They are phenomenal together," Dominic Beachler says. "They're like brother and sister, honestly." As a huge Marvel fan, Dominic says he was excited when she was hired for the movie. "I just started teaching my mom everything I knew about Black Panther and how important a character he is to African-Americans and to the diversity that Stan Lee helped bring into comics," Dominic Beachler says. "I did say, 'You better get it right.' I'm a huge nerd, and I wanted her to get it right, and I think she did. I think she did a great job with it." Dominic says that building worlds for movies comes naturally to his mother. In fact, Beachler grew up in Ohio with an interior designer mother and an architect father. "My mom would change the house every year depending on what the mood was," Beachler says. "The color palette constantly changing, the furniture changing, the paintings — like, you were constantly watching the rooms morph. "You know what I mean, like, I picked up very much my mom and dad's ability to go into an empty space or a raw space or a space that's not even there — and then see all of it. Because I would go with my dad to construction sites, and it would be nothing but a foundation, and he would talk me, like, 'Over here, can you see the line where the wall would go?' And he'd mime where it is. So I was raised to really visualize that, because I was going to construction sites with him since I was 6." 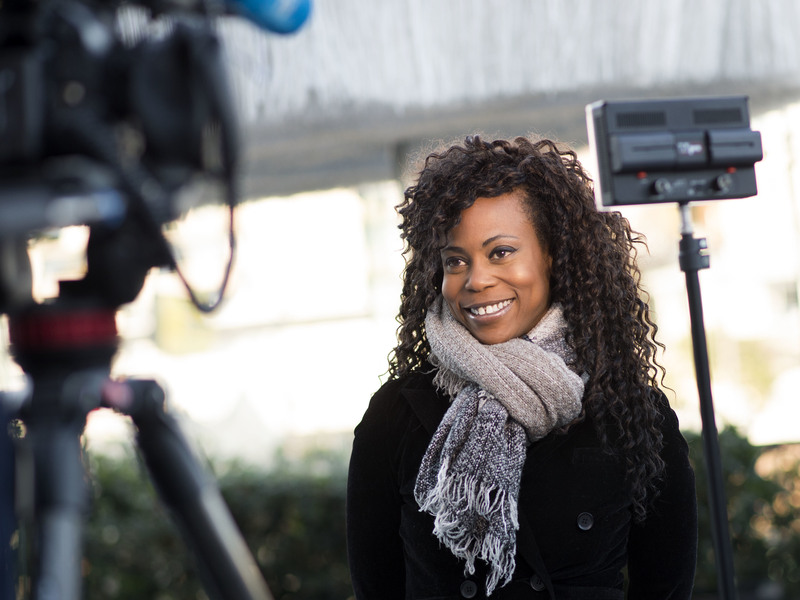 Hannah Beachler, pictured here in February 2018, is the first African-American nominated for an Oscar for production design. Beachler says she loved fashion design, and after moving to Cincinnati for college, she began working on a few local music videos and Super 8 films. One was Grrrrrrlll Possy, a campy indie grindhouse movie about a girl gang. Beachler directed the film, which she wrote and acted in with her friend Dana Hamblen. "It was kind of like an homage to John Waters or Ed Wood kind of movie," Hamblen says. "We never finished it. We were both in it. It was so bad — but hilarious." This was long before Beachler was a production designer for Ryan Coogler, or Barry Jenkins' Oscar-winning film Moonlight, or Beyonce's Lemonade album videos. As Beachler prepares for the red carpet, she muses about her historic nomination as the first African-American production designer up for an Oscar. "Of course you're like, 'This is the best day ever on the face of the Earth that has ever happened to me!' — of course, except for the birth of my son," Beachler says. "But then you do kind of think about what it really means in regards to your community and your ancestors. You also are reminded, in a way, how far sometimes we have not come. I'm the first? Where are we really in 2019?" After nine decades of the Oscars, Hannah Beachler could be the one. Marvel's "Black Panther" is up for seven Academy Awards on Sunday. It is the first superhero movie nominated for best picture. CHADWICK BOSEMAN: (As Black Panther) Wakanda forever. UNIDENTIFIED ACTORS: (As characters) Wakanda forever. GREENE: The woman who helped create the cinematic world of Wakanda is Hannah Beachler. She's the first African-American ever nominated for an Oscar for production design, and NPR's Mandalit del Barco has more. MANDALIT DEL BARCO, BYLINE: The Black Panther is T'Challa, king of Wakanda, a fictional African country that was never colonized, rich in tradition and advanced technology. 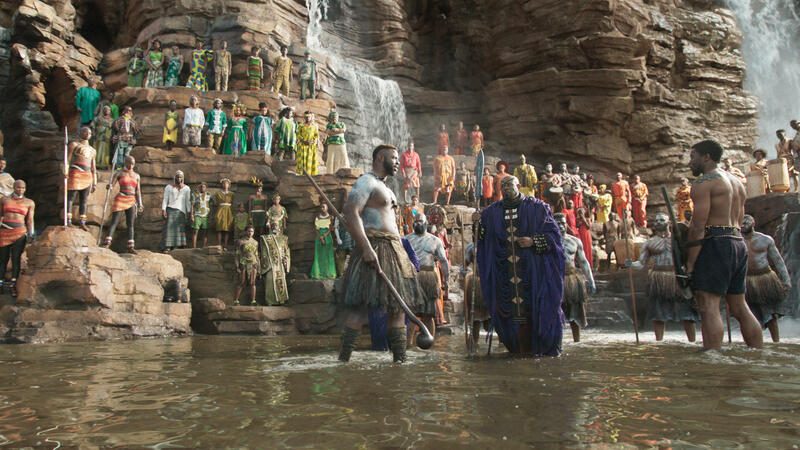 The movie's director, Ryan Coogler, says he wanted Wakanda to look and feel authentic. So he called on his longtime production designer Hannah Beachler. She says they traveled around Africa researching cultures, scouting locations and collecting ideas. HANNAH BEACHLER: The rocks, the moss on the rocks, like, how the rocks were formed, how they were layered, the color of them. Everything around me that was nature I took pictures of. DEL BARCO: Beachler also took note of the styles of architecture, clothing, food, transportation and ways of life. She incorporated these aesthetics with concepts from the original Marvel Comics created by Stan Lee and Jack Kirby. And Beachler came up with a history and production guidebook for Wakanda, what she calls a bible, for the movie. BEACHLER: To get to the design, I had to come up with stories about why this would particularly be there. Was it always there, and where did it come - did it move? So that's where we started. DEL BARCO: Beachler considered not just the design but the histories of Wakanda's buildings, its epic waterfalls, its weapons and gadgets. She designed a throne room with suspended birch logs, a pristine high-tech design lab. She imagined the backstory of vibranium, the potent and virtually indestructible element powering Wakanda. In the movie's DVD commentary, Coogler talks with Beachler about creating this vision. RYAN COOGLER: That's something that Hannah wanted Wakanda to fill all - we wanted to fill the history on it. And Hannah, you know, worked on a - how many pages was that bible that you made? BEACHLER: Five hundred and fifteen. COOGLER: (Laughter) Five hundred and fifteen. BEACHLER: It ended up being 515. DEL BARCO: Beachler made other production bibles for Coogler when she did the production design for his 2013 movie "Fruitvale Station" set in his hometown Oakland, Calif., and a bible for the boxing world of Coogler's 2015 movie "Creed." This time, the director says his friend's work included making the Black Panther's aircraft called a Royal Talon Fighter. DOMINIC BEACHLER: They are phenomenal together. They're, like, brother and sister, honestly. DEL BARCO: Beachler's 20-year-old son Dominic marvels at his mother's working partnership with Coogler. As a huge Marvel fan, Dominic says he was excited to help her prep for the movie. BEACHLER: And I just started teaching my mom everything I knew about Black Panther and how important of a character he is to African-Americans and to the diversity that Stan Lee helped bring into comics. I did say you better get it right. I'm a huge nerd, and I wanted her to get it right. And I think she did. I think she did a great job with it. DEL BARCO: Dominic says building movie worlds comes naturally to his mother. Beachler grew up in Ohio with an interior designer mother and a father who was an architect. BEACHLER: You know, my mom would change the house every year depending on what the mood was. The color palette constantly changing, the furniture changing, the paintings - like, you're constantly watching the rooms morph. You know what I mean? Like, I picked up very much my mom and dad's ability to go into an empty space or a raw space or a space that's not even there and then see all of it 'cause I was - would go with my dad to construction sites since I was 6. DEL BARCO: Beachler says she loved fashion design. And after moving to Cincinnati for college, she began working on music videos and Super 8 films. UNIDENTIFIED SINGER: (Singing) Girl posse. Girl posse. Girl posse. DEL BARCO: "Grrrrrrlll Possy" was a campy, indie, grindhouse movie about a girl gang. BEACHLER: (As character) Cut. Done, sweetie. Done. DEL BARCO: That's Beachler directing the film which she wrote and acted in with her friend Dana Hamblen. DANA HAMBLEN: It was kind of, like, a homage to John Waters or a Ed Wood kind of movie. We never finished it. We were both in it. It was so bad but hilarious. DEL BARCO: This was long before Beachler became a production designer for Ryan Coogler's movies, Barry Jenkins' Oscar-winning film "Moonlight" or Beyonce's "Lemonade" videos. BEYONCE: (Singing) I'm going to keep running 'cause a winner don't quit on themselves. DEL BARCO: As Hannah Beachler preps for the red carpet, she muses about her historic nomination as the first African-American production designer up for an Oscar. BEACHLER: Of course your like, this is the best day ever on the face of the earth that has ever happened to me, of course, except for the birth of my son. But then you do kind of think about, like, what it really means in regards to your community and your ancestors. I'm the first. Where are we really in 2019? DEL BARCO: In nine decades of the Oscars, Hannah Beachler could be the one. Mandalit del Barco, NPR News. Transcript provided by NPR, Copyright NPR. In the opening scene of Christopher Demos-Brown's play "American Son," a black woman sits alone in the waiting room of a Miami police station, desperately waiting for word of her missing 18-year-old son. Demos-Brown says the impetus for the story was a number of deadly interactions between American police officers and young black men in recent years. But he says his past experience working in the Miami-Dade State Attorney's office gave him a glimpse of the relationships between law enforcement officers that eventually made it onto the stage.